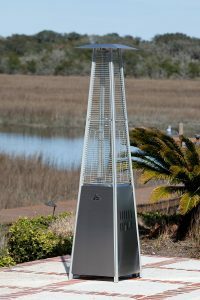 When we stared looking to review this Fire Sense stainless steel pyramid patio heater we first thought about not doing it at all. With 25% bad reviews we thought it would not pass our standard for reviews. But than we looked further and found that all the low ratings basically were about the assembling and the lack of instructions. Since this has nothing to do with the product quality we decided to review it anyway. The measurements says 21 x 21 x 88 inches. Weight of his heater is 60 pounds without the propane tank installed. 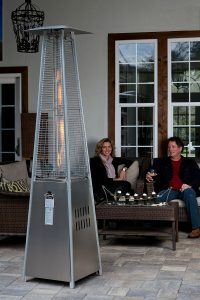 here are some questions people asked online before purchasing this pyramid patio heater. WE have included the ones we thought were relevant for you. Like we mentioned in our introduction to the Fire Sense patio heater most lower complaint were about the assembling of it. There are other people who had no problem with it and they gave some tip. 1:All screws are the same size so do not worry about that. 2:Do not use a power-tool. 3:The back is where the wheel go. 4:The control unit goes on the front. If you keep these tips in mind it should not be too hard to assemble according to this buyer. Gives of not as much heat as expected was one other complaint. I wonder than where it was placed and what the outside temperature was. Wind blows out the flame we read a few times. There is a vent hole on the side and if you turn that side away from the wind there should be no problem. All the other things that were mentioned were that it was a decent patio heater for the money. The looks and flames were all mentioned as beautiful and this made up for some of the complaints they had at first. After reading a ton of reviews and opinions we had to let that sink in for a minute. Like mentioned in our introduction at first we were going to skip this patio heater because of the low overall rating. We can recommend this patio heater from the Fire Sense company as a decent buy for the money you pay for it. It is no top quality and outsourced to be made in China by the company. Assembly seems to be the biggest problem for a lot of people and that is where most complaints came from. But if you read our tips in the customer review section you can read that if you follow a few steps is not too bad according that user. I think that the rating of 3/7 is to low for this heater. That is why I gave it a 4.0. We have mentioned before that a patio heater like this pyramid shaped one is not for cold nights. It can be used for the cooler summer nights and than you can expect a little warmth from it. Remember your are outside and not inside! The flames and looks is something everyone agreed on. This heater looks great and the flames flicker and shine real nice. It is an eye-catcher on your deck or patio. 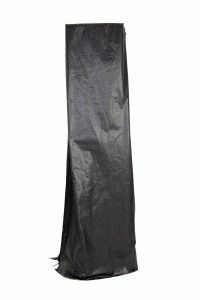 A quality cover is always a must for everything we keep outside and we would like to last a long time. This pyramid patio heater is no exception to that rule. We found that the Fire Sense full length outdoor patio heater cover fits great on the Therm Tiki. ==>>Find the price here! Or click on the picture.